Whisk together sugar, cornstarch, salt, and yolks in a heavy saucepan until combined well, then add milk slowly, whisking constantly. Bring to a boil over medium heat, still whisking. (It's good for your upper body strength.) Reduce heat to a simmer, still whisking, 1 minute. Filling should be nice and thick. Do NOT stop cooking unless the eggs have cooked and thickened up, which happens at 140 degrees. Don't think it will thicken in the fridge and then have to cry at your auntie's birthday when it's served in pudding bowls. Whisk in melted chocolates, butter, and vanilla and spoon filling into crust. Chill in fridge while making the meringue. Preheat oven to 350. Add egg whites, salt, and cream of tartar to the mixing bowl. Beat until soft peaks are forming. Gradually add sugar until hard peaks. Spoon onto pie, making sure to seal all the way to the edges so the meringue doesn't shrink when baked. 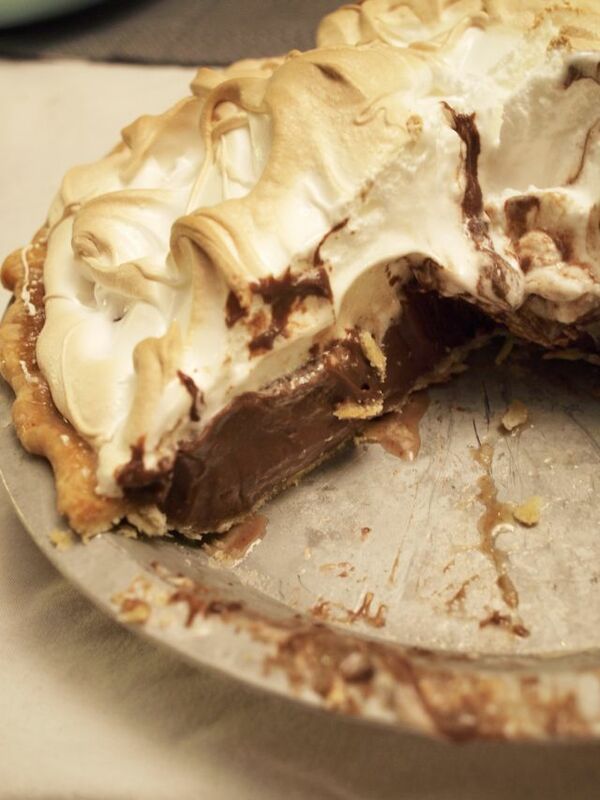 Bake pie in a 350 degree oven for 15 minutes until meringue is golden on the tips. Chill pie at least 4 hours before slicing.